Born: 9th October 1819, christened 25th April 1820 at St Marin's in the Field, Westminster, and died 19 February 1906 at Lakefield Mohill Leitrim. Daughter of: Arthur Cuthbert Marsh (1786-1849) and Anne Marsh (Marsh-Caldwell, nee Caldwell, 1791-1874). 1. 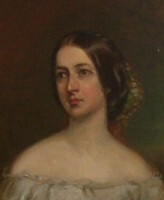 Eliza Louisa Marsh-Caldwell (1818-1913). 2. 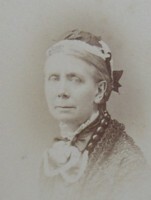 Georgina Amelia Marsh-Caldwell (1820-1900). 3. Rosamond Jane Marsh-Caldwell (1823-1911). 4. Arthur Marsh, who died an infant, August 1824. 5. 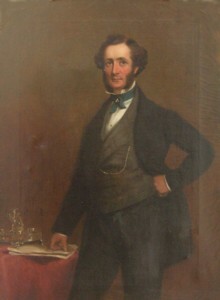 Martin William James Marsh (1825-1846). 6. Lady Mary Emma Heath (nee Marsh, 1826-1902) who married Admiral Sir Leopold George Heath (1817-1907). 7. 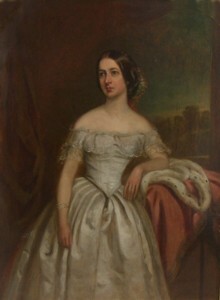 Hannah-Adelaide Loring (nee Marsh, 1828-1859) who married Edward Henry Loring (1823?-1879). Frances married: 22 June 1848 in Walford, Lt Col Richard Henry Crofton RA (later Maj Gen, 1818-1897), 4th son of Duke Crofton Esq and Alicia Crofton (nee Jones) of Lakefield, co Leitrim. 1. Amelia Alicia Anne Isaac (nee Crofton, 1849-19??) who married John Swinton Isaac of Boughton Park, Worcester, eldest son of John Whitmore Isaac. 2. Captain Duke Arthur Crofton RN (1850-1917) who married Augusta Maude Lefroy (1854-1938). 3. Maj Richard Martin Crofton RHA (1854-1899) who married Marion Emma Heath (1856-1949). 4. Maj Henry Caldwell Crofton RHA (1856-1947) who married Helen Rose Ann Millman. I have very few primary sources of information on Frances, except for a brief mention in the book "Crofton Memoirs" by Henry Thomas Crofton, 1911, page 201. I hope the following gives a reasonable overview of the information at hand. Frances, known to her family as "Fanny", was born in 1820 and during her early childhood lived with her parents in the London area but exactly where I am not sure. This must have been a rather unsettled time, as when Francis was only four years old, her parents lost most of their money, when the family banking firm of Marsh Sibbald & Co became bankrupt. Frances' father, Arthur Cuthbert Marsh, found it difficult to recoup the family finances and during this time Frances' mother, Anne Marsh, in an effort to support the family, started writing novels. Anne's first novel, "Two Old Men's Tales", published in 1834, was an immediate success, however, with a family of 7 children to support, they were still very short of ready cash. By 1839, in an attempt to keep their living costs to a minimum, they were living in Boulogne in France. Eventually things began to improve. Frances's father Arthur came into a small inheritance from a distant friend of the family. Her mother Anne Marsh also received an inheritance from her father James Caldwell. At the same time Anne was writing more books and this was also bringing in more money. With the family finances still rather difficult but improving, the family were able purchase the Eastbury Estate, near Watford, and they moved back to England to take up residence in early 1842. Presumably Frances lived on the family estate at Eastbury until she married in 1848, at the age of 28. Francis' husband was Lt Col Richard Henry Crofton (later Maj Gen) of the Royal Artillery. He was the fourth son of Duke Crofton Esq (1768-1845) of Lakefield, co Leitrim. There was a slight scandal associated with Richard as he had previously fathered a child out of wedloc. A lovely day, got up early in order to be in time for the Train which stared for Pinner at 11.10 from the Euston Square Station: we got there half an hour before our time. On reaching the station at Pinner found a carriage waiting for us, having been ordered previously by Arthur Marsh. We intended to have dressed here, but there was no town? whatever, so we had to drive about a mile further and put up at a dirty miserable pothouse of an Inn;- there was no alternative:- however Grace managed with the help of her maid "Dowd," to change her dress in less than half an hour, and by ½ past 1 o'clock, we found ourselves at the Marsh's, "Eastbury." The wedding was over, but the people had just sat down to the Breakfast and on our being discovered on entering places were soon made at the table for us. The Bride was covered with orange blossoms and I cannot say that they became her, or that her appearance enchanted me. All the Bridesmaids were dressed alike in white muslin: these were the five Miss Marsh's, my cousin Susan Downman, Miss Holland and Miss Hutton. There were at least 130 people present I should think; some of them whom I recollect, were Sir Harry and Lady Milman, Sir Hyde parker, Miss Milman: Lady Gifford and her daughter: the Reverend Gifford (her son) who was the Clergyman officiating at the ceremony. Colonel Shee, a relation of mine, Colonel and Mrs Eden: Mr and Mrs Graham Pigott:- the Roscoes, and the Hollands, cousins of the Arthur Marsh's: then their Aunts Miss Amelia and Miss Georgina Marsh, also Madame Gabiou (who was a Miss Marsh) the prettiest girl was Miss Holland. There was an immensity of speeches - Captain Crofton, the Bridegroom, made a long but stupid speech, his brother made a better. Sir Hyde Parker proposed the health of Arthur Marsh, and he returned thanks. Then the health of the young Clergyman, Gifford, his was tolerably good, he reminded me of Sir Aflred Stephen. The Bride cried a good deal as she said "good bye," so did her mother, all the others were happy enough. The Breakfast was a sumptuous one. Opposite me sat Downman (my cousin), we never had seen each other before, and he was delighted when he heard my name, and we became the best of friends immediately. He is in the 65th Regiment and quartered at Kinsale but has a month's leave. His manner is very much like Frank Forbes. I was sorry that my Aunt and Sir Thomas Downman were not present as they intended, but he does not like leaving Woolwich, on account of these Chartist Meetings. The Bride and Bridegroom were driven to Watford as they intended going by Railway to Leamington, en route to Port-where his company is quartered. After they had left, the people strolled out of doors, some into the woods, others on the lawn; in the green house, in fact, wherever they fancied. All the Ladies wore Bonnetts at the breakfast with the exception of Grace, and all the gentlemen nearly wore frock coasts in which it is the fashion now to be married. CROFTON, Frances Mary of Boughton-park Worcester widow died 19 February 1906 at Lakefield Mohill Leitrim Probate Worcester 5 May 1906 to Amelia Alicia Anne Isaac widow. Effects £4,734 15s. 3d. Resworn £2,424 13s. 3d.